The Chakras are an ideal roadmap for personal growth and development. In 2017 we started our journey through the Chakras and focused on one energy center a month. We are going to keep on going in 2018! On our monthly adventure, I am going to educate you about a Chakra and then ask you to contemplate its function and roll in your own personal growth. February brings us to the Knee Chakras, minor chakras on the back of the knees; in the hollows of the knee joint. These chakras influence your progress and forward movement. This month, the Knee Chakras ask you – What is keeping you from moving forward in life? Do you have goals and dreams you have trouble achieving no matter how hard you try? Brief Overview of the Chakras: Our subtle energy bodies are made up of numerous energy channels that all together form a matrix. These channels flow through and around the body like highways of energy. These flows of energy are known as nadis in the Vedic tradition and meridians in the Chinese Medicine tradition. Where these flows of energy crisscross and intersect is where the chakras are formed. The Chakras are energy centers and vortexes in our subtle body. Seven large energy channels crisscross to form the major chakras (Root to Crown). These large energy channels are the flow of manifestation, liberation, expression, reception, ida, pingala, and sushumna. Minor chakras form where the lesser nadis cross. As there are many nadis, so there are many minor chakras. The Chakras are openings for life energy to flow into and out of our aura or electromagnetic field. There are main Chakras, minor, subpersonal, and transpersonal Chakras. The Chakras’ function is to vitalize the physical body and to bring about the development of our self-consciousness. Each Chakra is associated with certain physical, mental, emotional, and spiritual interactions. Each Chakra has personal growth themes, functions, and purposes. The concept of the Chakras has been around for thousands of years; but the energy coming to us from the cosmos is changing. We are receiving potent and new energies of high frequency light from the universe. The main Chakras (Root to Crown) were appropriate for us these past 2000 years. As we move into a new era, chakras above, inside, and below the physical body are forming and others are waking up from dormancy to help us evolve into our new future. Our journey through the Chakras will focus on ALL of these Chakras; main, minor, subpersonal, and transpersonal. 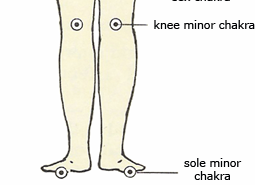 The Knee Chakras are minor Chakras located on the back of the knees, in the hollow portion. There is one on each knee. These energy centers are usually seen as some shade of brown, deep red, or magenta. These chakras influence your emotional, personal, and spiritual progress and forward movement. Please do not assume that a minor Chakra is not as important as a major Chakra; all the energy centers work together to keep us whole, complete, and balanced. Minor Chakras each work with a Major Chakra. The Knees work with the Root Chakra. The Root Chakra area (and corresponding minor chakras) is where many primal emotions are processed and released to the earth to be transmuted. When we allow these emotions to take up residence and do not release them and let them flow through us, they can become ‘stuck’ and influence our life in negative and unwanted ways. Fear often inhabits the Knee Chakras…. fear of change, fear of success, fear of death, fear of losing control, fear of the unknown, etc. These fears hold us back, stop us from moving forward, and effect our progress in life.